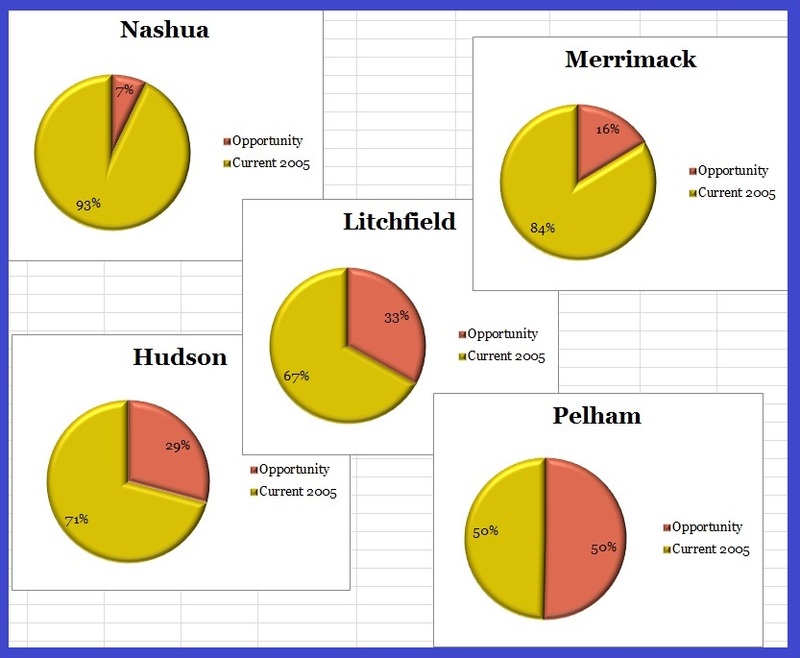 Region-wide Buildout Impact Analysis from the Nashua Regional Planning Commission. Thank you Jen Czysz for helping me find this study. There are areas in southern NH that are ripe for development. I happen to be working on a group of properties in Litchfield and was doing an analysis on vacant land. It got me thinking of what the development potential is in the surrounding towns. Read the conclusion…you’ll like it too if you don’t fall asleep. 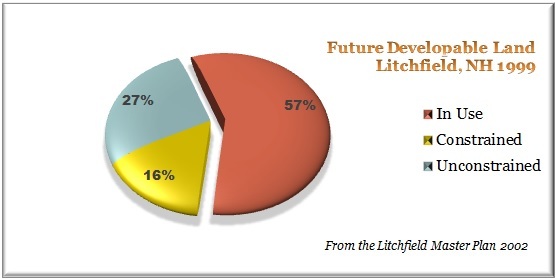 According to the town of Litchfield, NH’s Master Plan (Table V111-2 p.9) there are: 5,620 acres of land in-use(built upon), 1,541 acres constrained(cannot develop), and 2,622 acres are unconstrained (able to develop). This data is from 1999, yeah it’s old. The charts below give you a better perspective of what may be available to develop. Many towns have a proactive zoning ordinance that tracks the growth and can restrict building permits if/when the infrastructure cannot meet the needs. The top, Nashua, has the least availability…the 2nd largest city in NH by population, no surprise. I was completely taken back by Pelham…I double checked: 50%? Read the NRPC PDF which explains the process of what factors they used. Note: the data is from 2005, this would change if the town zoning requirements where modified otherwise it should keep fairly consistent being a percentage. So all of these towns/city are in southern NH…easy commute to Boston. Why do Pelham, Litchfield, and Hudson have so much potential? Look at a map…highway access!! SO REMEMBER…widen a highway, and you will have a lot of new development in these towns.